Episode 29 of the Emptyspiral Podcast is out today and we introduce a new segment! The ES Quiz! With Russ as gamesmaster we try (and fail) to answer questions on Lacuna Coil. Then we review and rate the song Purify from the Unleashed Memories album. Check out the new Podcast Forum if you want to discuss the ES Podcast. 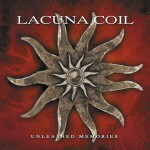 The Lacuna Coil FAQ can be found here.